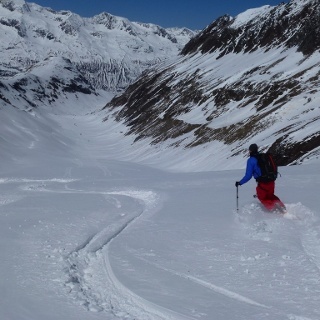 Great, high alpine glacier tour, which should only be experienced by experienced winter climbers. Depending on the circumstances also handling of ice ax and crampons is necessary. The Liebenerspitze, situated directly on the Ötztal main ridge on the border to South Tyrol, divides into a main summit 3400 m, which is reached through the Gaisbergtal and into a western peak 3395 m, which is climbed over the Rotmoostal. 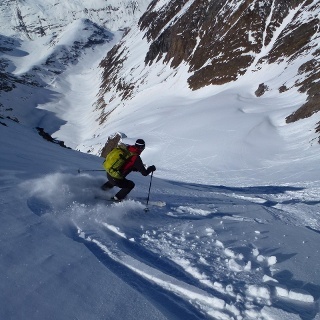 Both variants count here at the main alpine peak at Obergurgl to the great, high-alpine glacier tours, which should only be experienced winter mountain climbers, especially as skitechnical requirements in the ascent and descent also the skilful handling of ice ax and crampon depending on circumstances. On the tour of the Rotmoostal on the western tip of the Liebener peak 3395m, you will start from the Obergurgl in 1920m, first in the ski area towards Schönwieshütte 2266m. From here we continue for a long time through the mellow and flat Rotmoostal to the tongue of the Rotmoosferners. You must not forget that you have to go back here. If you rise in the spring through this shapely, glacial valley, the adjoining slopes should have unloaded as far as their avalanche strokes, which can then be decisive for the return journey. 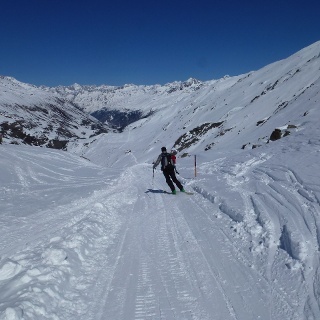 But otherwise you will be on a farm in the avalanche area. This applies to the rest of the glacier as well as to the risk of gaps. Even in the snowy winter of 2011/12 here on the Ötztaler Hauptkamm, columns in the area of ​​the route were not an issue. Over the west-exposed part of the ferry one ascends in quite a pleasant slope to the end of it. The terrain then climbs up to 40 °, and then you should change to the southwest ridge as quickly as possible. 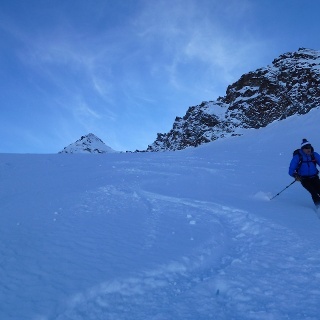 On the south-western ridge itself you get as far as possible with skinned skis. 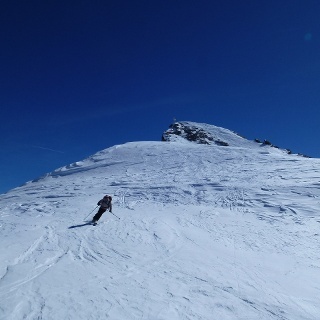 But then the ridge rises to over 40 ° and you have to pass approx. The last 100 altitudes into the Stapf. But you should have ice ax and / or crampons. 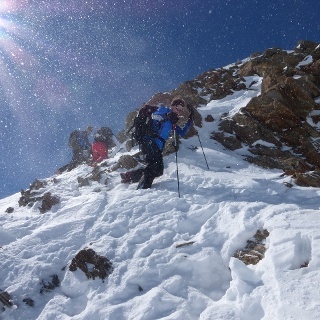 And in the snowy winter 2011/12 crampons were not so ideal, because one had to change in the ridge course repeatedly from pickelhart frozen snow on rock. Whether this is the case in a snowy winter as well, is beyond my knowledge. A pimple would certainly have done better. 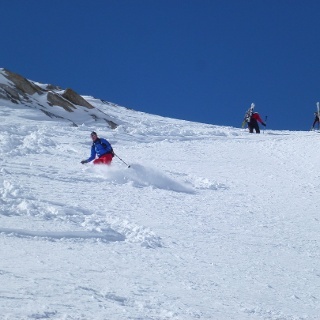 In any case, it is clear that this tour is a classic spring holiday with a very high alpine character. The descent takes place in the ascent area.